Indigo Medical provides compliance approval services for a number of pharmaceutical companies at UK and above country level. 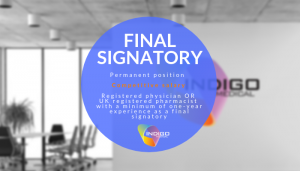 The focus of this role is the review and approval of a wide range of pharmaceutical industry generated promotional and non-promotional materials across multiple therapy areas, for technical accuracy and compliance with national and international codes, such as the ABPI and EFPIA Codes of Practice. disease awareness and press materials. Dissemination can be via hard copy but is increasingly digital, e.g. video, website, app. Final signatory for full range of client materials, ensuring compliance with national/international codes and client’s internal policies. Final certification of UK specific materials. Review materials for approval, providing expert judgement on the quality and legitimacy of assets, in order to meet compliance regulations. Ensure reviews are completed to a high standard and within timescales. Involvement in developing materials such as promotional claims guides and training modules for the pharmaceutical industry. Collaborate with the internal team, the client and external agencies to achieve positive outcomes. Work across different sectors of the internal business in order to create materials for in-house and client use. Key role in mentoring junior members of the Compliance team to become proficient in technical copy review and to develop nominated signatory skills. Support the Head of Compliance with continuing development of the wider Compliance team. Opportunity to attend and assist at Congresses. Include FS3 in the subject line. Indigo Medical is an innovative expanding Medical Communications and Compliance Agency which provides tailored solutions to the pharmaceutical industry. Our clients include both large blue chip and smaller niche pharmaceutical companies. Operating out of our Milton Keynes based office, we have a growing team of physicians, pharmacists and life scientists.